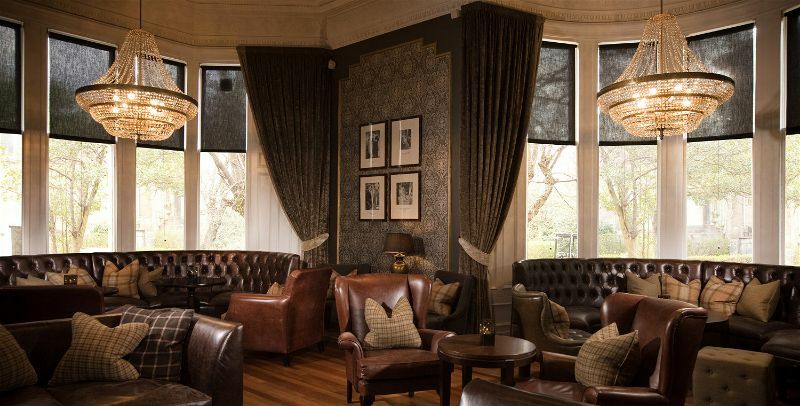 Take a trip to the iconic One Devonshire Gardens and relish in the luxury of the Hotel Du Vin Glasgow. 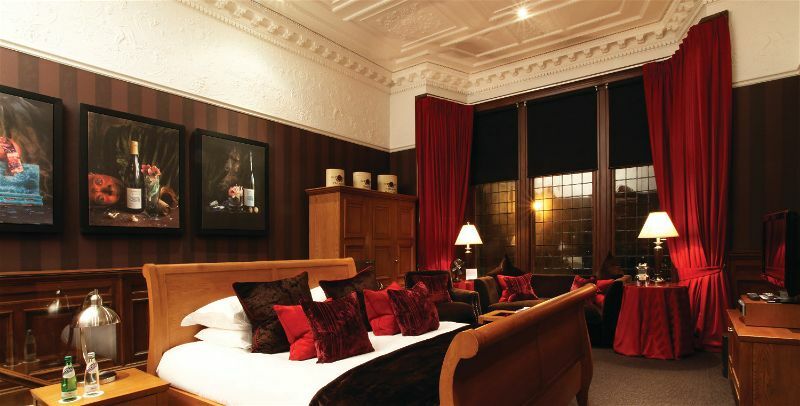 The stylish hotel is situated in the fashionable West End of Glasgow, just 30 minutes from the famous Loch Lomond. This luxury hotel offers something truly spectacular. With 49 bedrooms offering individual style and bespoke service, you can guarantee the best of nights sleep at Hotel Du Vin Glasgow. This perfect location nestles you between the bustling shops and clubs in the city centre and the boutique cafes and attractions of the West End. Experience the grandeur of the dining rooms for dinner, a light lunch or for a special event. The options are endless with Hotel Du Vin Glasgow. 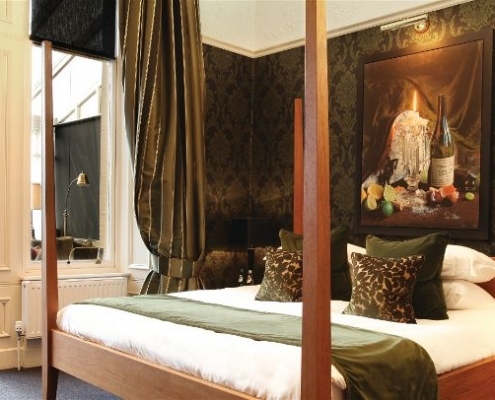 Set within the Victorian One Devonshire Gardens, this fashionable hotel features the same Victorian theme throughout. With luxury prominent, the décor eludes glamour and sophistication. With a choice of standard, deluxe, studio and suite rooms there’s something for everyone’s needs. As all rooms are unique and individual costs and décor differ from room to room. The 3AA rosette awarded bistro exemplifies the Hotel Du Vin’s passion for food and drink. 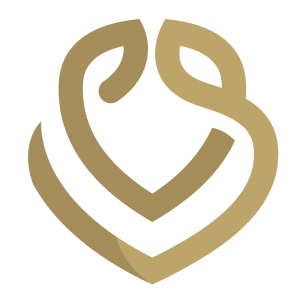 Enjoy locally sourced food of the highest standards where the wine and cocktails will flow happily. 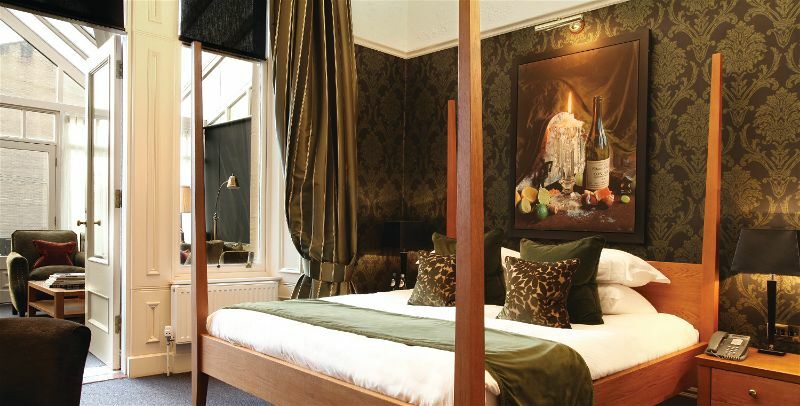 Whether you intend to socialise, celebrate or romance the Hotel Du Vin Glasgow is the perfect spot. Enjoy an exquisite dinner, sure to tantalise your taste buds or a hearty Sunday roast to bring the family together. Indulge in the splendour of afternoon tea with beautifully crafted sandwiches, pastries, and cakes. Why not treat yourself and enjoy a glass of fizz and make it that little bit more special. Go on, why not be decadent and treat yourself. 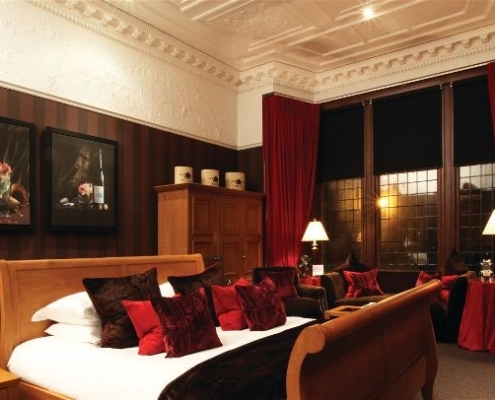 The Hotel Du Vin Glasgow offers facial treatments, body treatments, luxury manicures, semi-permanent makeup and male treatments. There really is something for everyone at Hotel Du Vin. Why not treat yourself with a beauty treatment and feel glamorous for your evening meal or trip into the town. 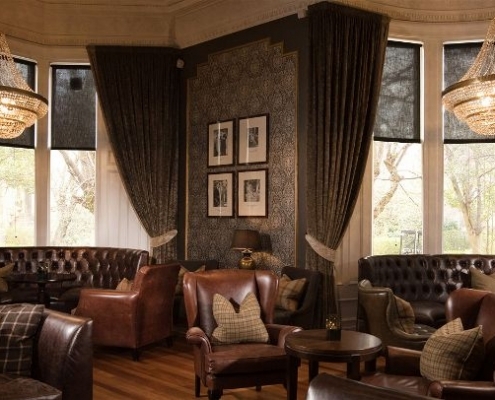 At the Hotel Du Vin Glasgow, there’s so much to see and do. Glasgow is one of the most cosmopolitan Europe destinations and boasts the title of one of the most attractive places to live, work and visit. With an abundance of galleries and museums to visit, you’ll be spoilt for choice with the attractions on offer.